Just a couple miles from the center of town, this sweet little cabin is nestled back, among the pine trees, away from the street with a private circular driveway. There is a large deck with picnic table and bar b q that is perfect for sitting back and relaxing with a glass of wine and watching the little critters run around the property. Squirrels, deer, and more varieties of birds than we can list. There is lots of room for your own little ones to run, explore, climb trees, and enjoy mountain life. Inside, the cabin has two bedrooms. The master has a queen bed and the other has a set of full size bunk beds Perfect for 4 kiddos or adults to sleep or make a fort. The cozy little bathroom has a shower and, like all our homes, fluffy clean towels In the large living room, there is a huge TV and two couches. One folds out into a queen size bed. This living room has lots of windows so you can enjoy the lovely scenery outside while you are snuggled up in front of the amazing fireplace. The kitchen is adorable. Vintage feel with all the comforts of home including a wine cooler and built in dining nook. 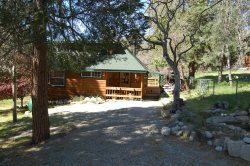 Close to Idyllwild Arts and the Grotto this cabin is perfect for the family getaway or a couple looking for privacy to relax. 2 Full size bunk beds. This property is located 1.7 miles from the heart of town.